Quoting for small works, maintenance and projects in the building maintenance industry. Companies in the building maintenance sector carry out a large number of individual jobs. A lot of these jobs require a quotation before the customer will give the go ahead for work to be carried out. It’s typical for people raising quotes to have their own way of doing things. They might create quotes on Microsoft Word and store the record of the enquiry in a spreadsheet. Quotes are normally emailed directly from that person’s inbox. This means that other people in the business have very little visibility of the pipeline for new business. Job quoting software is vital to make sure that information is shared between colleagues and that there is a standard process for quoting customers. When an enquiry comes into the business via phone or email, your back office team can quickly log it into the system. If the customer is brand new, it's easy to create them in seconds using our Google Places integration. If you are able to price up the quotation immediately, you can do so and email it straight out to the customer from the system. We can add your company logo and business terms to professional looking templates to make sure that your brand is represented consistently. If you need to book a survey visit, you can schedule it using our diary. This visit can be deployed to the surveyor's mobile app and they can price the job on their device. 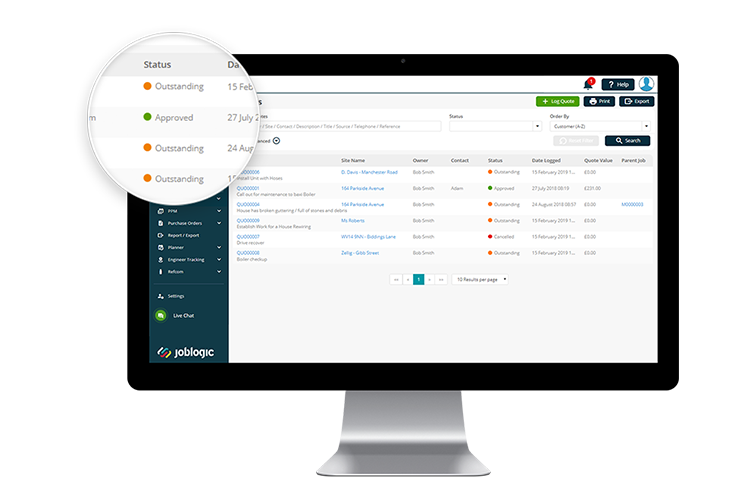 Once an enquiry is logged, your staff can search for it and find it in a single screen. Enquiries are status tracked from new quote to ordered or rejected status. Each enquiry has a unique number and you can select the source of the lead. Our quote dashboard displays useful metrics such as predicted new business, quotes won vs lost, and your average quote value. It's easy to create quotes using a library of selling rates and our parts catalogue that you can keep up to date with prices and suppliers. Quotes can also be quickly revised or edited, then emailed to customers. You can store details of all correspondence with customers using the Notes section, so colleagues can see what's been discussed and what the current status is. When your customer approves a quotation, it's a click of a button to turn the quote into a live job for scheduling. This saves so much time because 99% of the job information has already been entered into the quote. Simply enter the customer's order number if they provide one and click upgrade. Any attachments and notes automatically get copied into the job, so your colleagues can see exactly what's been agreed and what needs to be done. If you give customers access to the portal, it's even easier. They can login and see the quotes that require approval. They can click approve, enter their order number on screen, add comments and even upload documents (e.g. their standard purchase order). This is a great way for sharing information with your customer. For example, let's say you're quoting for a large installation job. All documents associated with the quote can be attached in the portal for the customer to view or download. This might include RAMS, photos and drawings.